That will be the word of the day ~ Oscarlicious! Why, you ask? As far as design inspiration goes, I was particularly drawn to two dresses at the 2011 Academy Awards worn by Gwyneth Paltrow & Hilary Swank. The show stopping designer gowns sum up the modern glamour style I’m seeking to portray in our master bedroom. 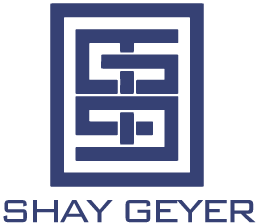 They instantly sent me into a creative frenzy when I saw them. I’ve been planning this dream bedroom of mine in my head for years & I’m finally taking the leap to create it. Not overdone. Not heavy. Simple elegance & sophistication that exudes glamour. Touches of traditional combined with modern options & fabulous finishes. I love the metallic effect that both of these dresses offer & the textures of the fabrics are to die for! The colors are even in the range of the color palette I have chosen for our bedroom. Platinum, nickel, cream & gold are the stars in the room. I’ve painted the walls Benjamin Moore’s Pale Oak & our trim color is Benjamin Moore’s Could White. We have great windows in our sitting area & the room gets fantastic natural light. So, let me give you a sneak peek at my game plan. This is the bed I designed for my husband & I. It is my dream bed! I have been searching for a bed like this my whole life! No joke! I worked with CR Currin ( a line we carry at IBB) to tweak one of their new beds to carry out my vision. It’s upholstered in a chenille tweed from Kravet. It’s hard to tell from the photo but there are metallic threads woven into the fabric. 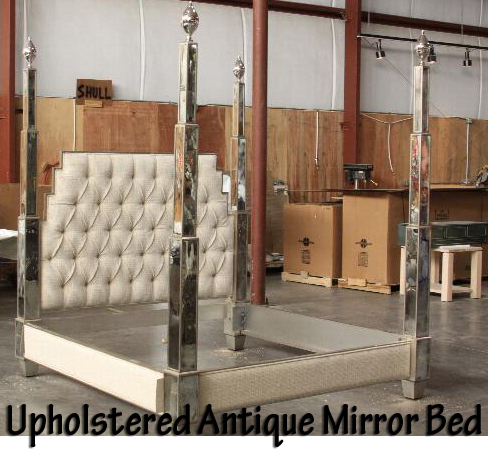 The posts are covered in a smoky antique mirror & the bed is finished in a stunning silver leaf. The factory sent me a photo of it when it was done. It is shipping this week & I could not be more excited to get it into our room! To set off our gorgeous bed, I wanted to find something really spectacular to accent the bed wall. When I saw this wallpaper from Albert Van Luit, my jaw dropped! It was just the thing to do this bed justice. 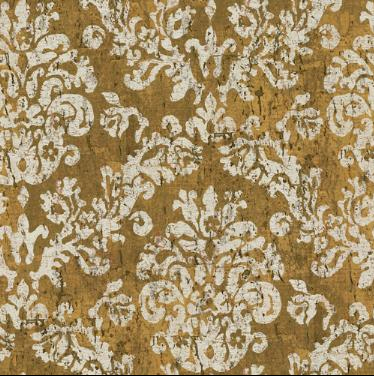 It’s a natural grass cloth wallpaper with a large scaled Damask pattern created by silver & gold leaf. The texture is delicious. This has my name written all over it! It makes a powerful statement, so I’m not covering the entire room in it. That would be crossing over into the overdone category & that’s not what I’m going for. It will be a fabulous focal point behind the bed. It’s brand new to the collection, so it won’t be in until the end of March. Good things come to those who wait… I’m dying to get it up in the room! Lighting for the room will take on a more modern flair. I love these selections juxtaposed with the Damask wallpaper. The lamps I’ve chosen are from Global Views & very grand in scale. They will sit like sculptural art on our nightstands. 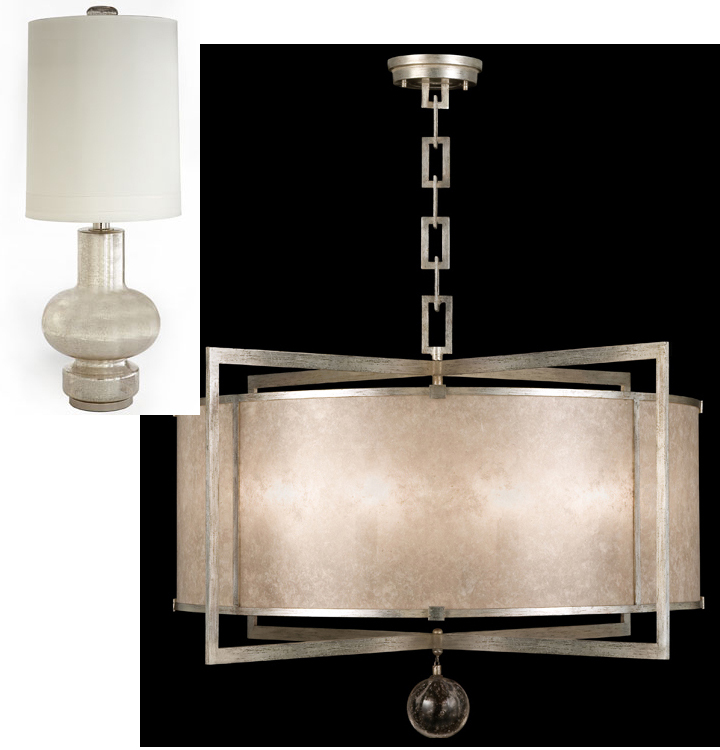 The inside of the mercury glass base lights up & shows off it’s illustrious qualities. It’s simply magnificent. You can light just the base (romantic ambiance), just the lamp (task lighting), or both at the same time (you get the best of both worlds!). The chandelier from Fine Art Lamps will hang over our bed. The photo shows the design of the chandelier. I’ve ordered it in a silver leaf finish with a translucent mica shade & metal frame. It will showcase the silver & gold finishes being used in the room in one piece. I hope you enjoyed today’s sneak peek into my house! I can’t wait to share the room with you when I get it all done. Mixing finishes in a room can give you a brilliant interior. You just have to find the balance. Get inspired & go make your room Oscarlicious!